Sandra Anderson, left, Alexx Draper and Lily of Paris all have parts in Her Majesty’s Players production of The Hunchback of Notre Dame. Wishbone hasn’t been the only dog to play a pivotal role in the Hunchback of Notre Dame. In May 2013, Lily a 5 year old Yorkish Terrier was casted in the Hunchback of Notre Dame for the Majesty Player’s. Lily’s owner, Sandra Anderson played Madame Falourdel. Alexx Darper played her daughter. Lilly brought a comic relief to this version by chasing soldiers across the stage. 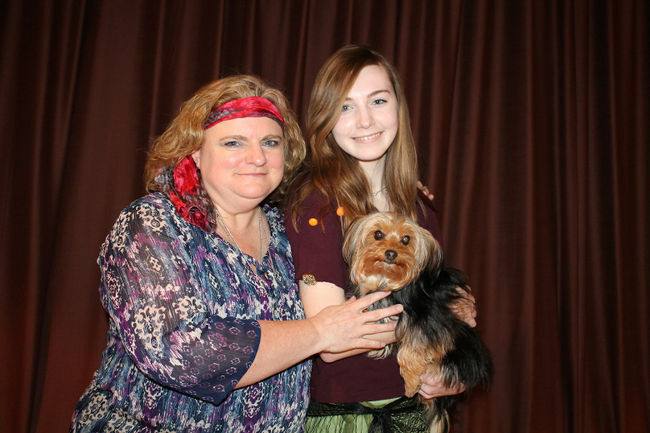 Lily’s next role was Toto in Brant Theatre Workshop’s Wizard of Oz. Considering the metaphor for Quasimodo’s loyalty toward Claude, I’m a little surprised that a dog hasn’t portrayed Quasimodo more than just a handful of times. But I suppose with a character described as Quasimodo is, people want to see UGLY and even the “ugly” dogs are often really cute.